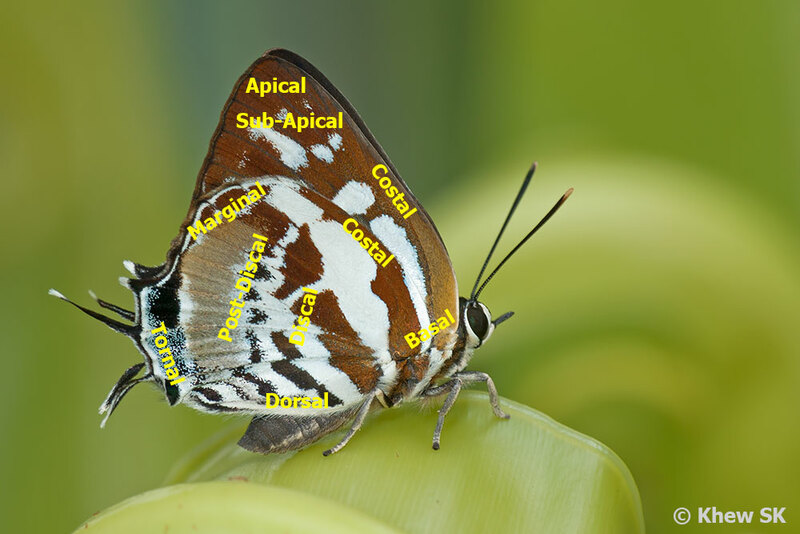 In Part 1 and Part 2 of the previous weeks' articles on butterfly anatomy, we learned about the naming of the various parts of a butterfly. In particular, the names of the external margins of the wings and the wing venation naming convention based on the Numerical Notation system. 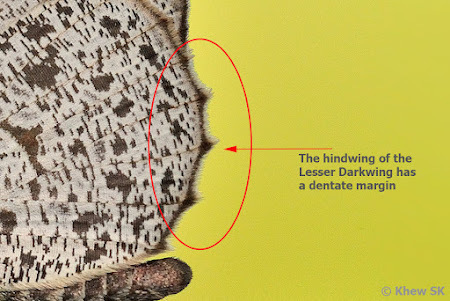 By now, we should be familiar with the terms like termen, costa, tornus and so on, which are descriptors of the external margins and angles of the wings. 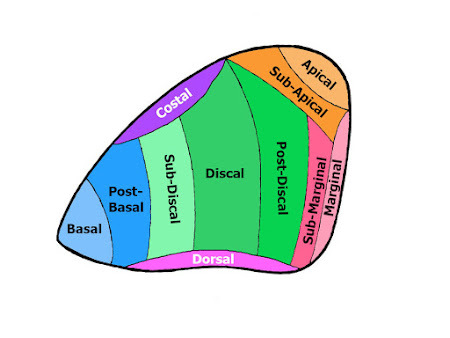 An understanding of the naming convention means that the positions of the spots, bands, lines, and various features can be accurately described. 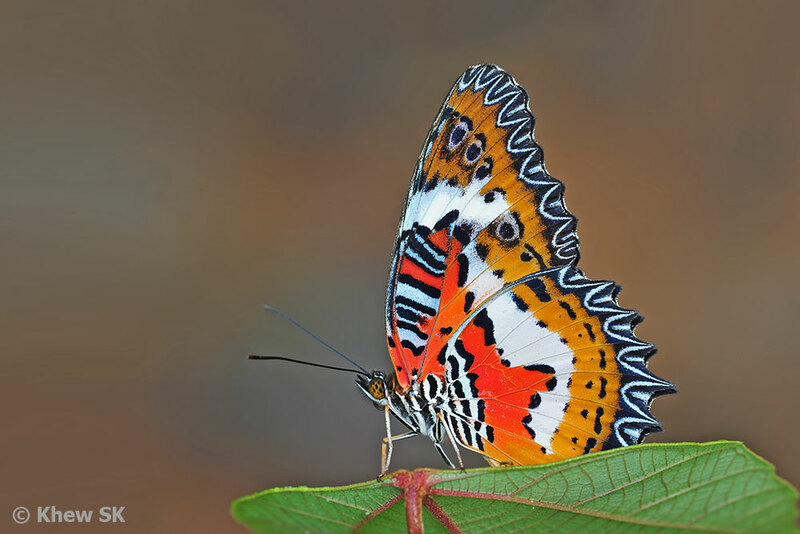 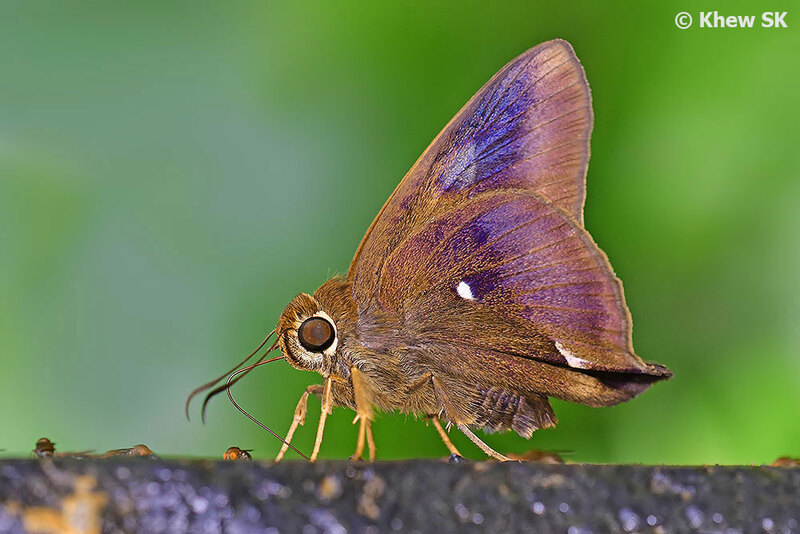 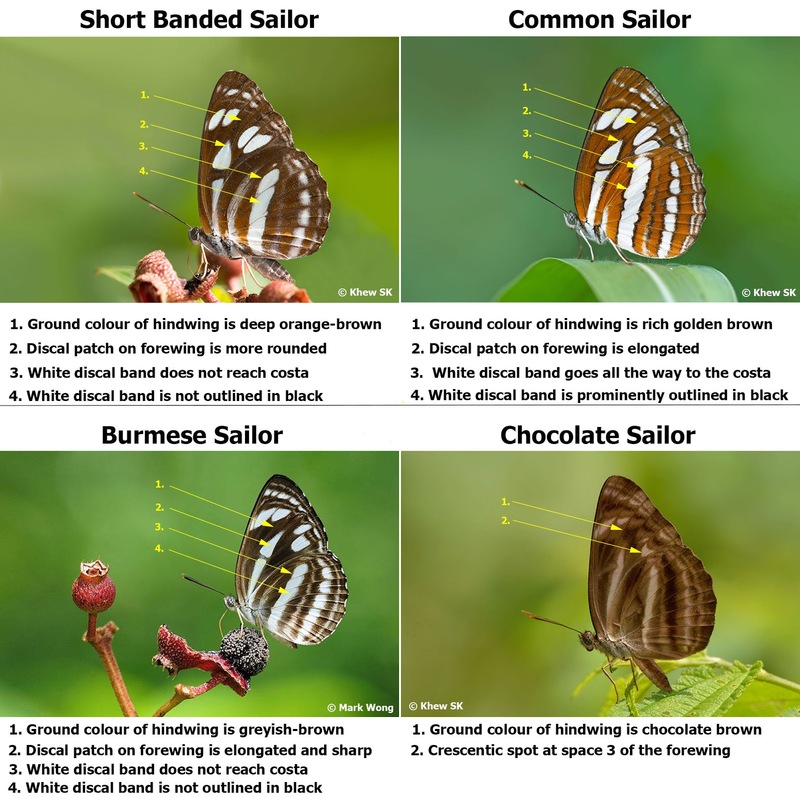 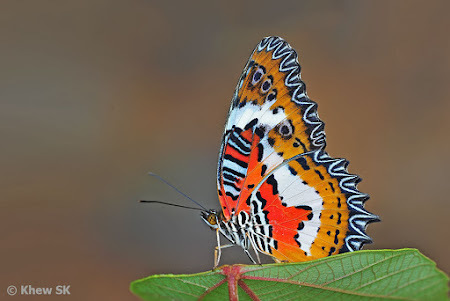 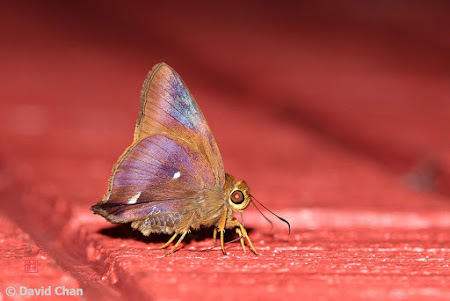 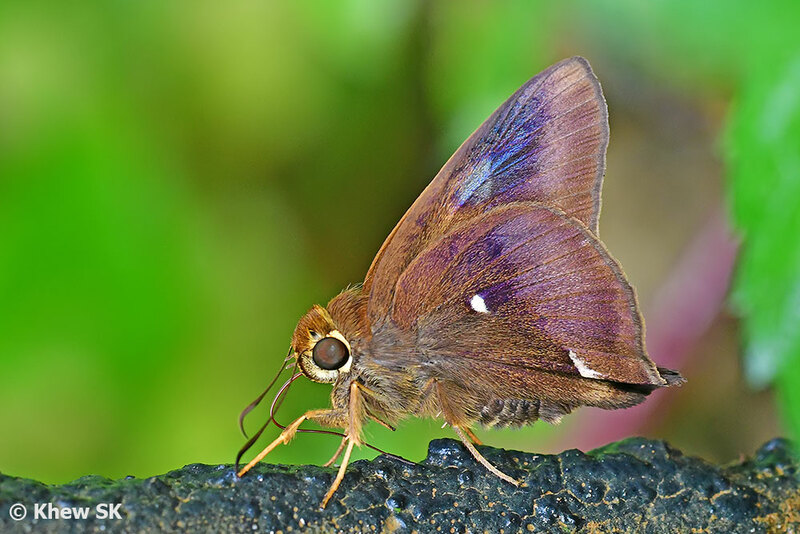 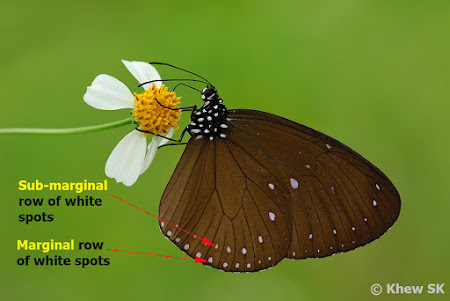 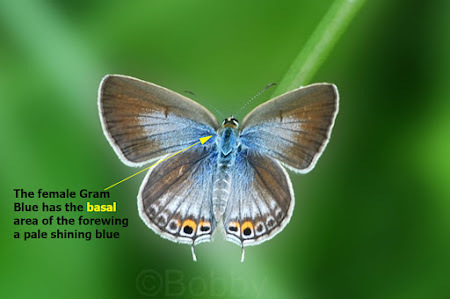 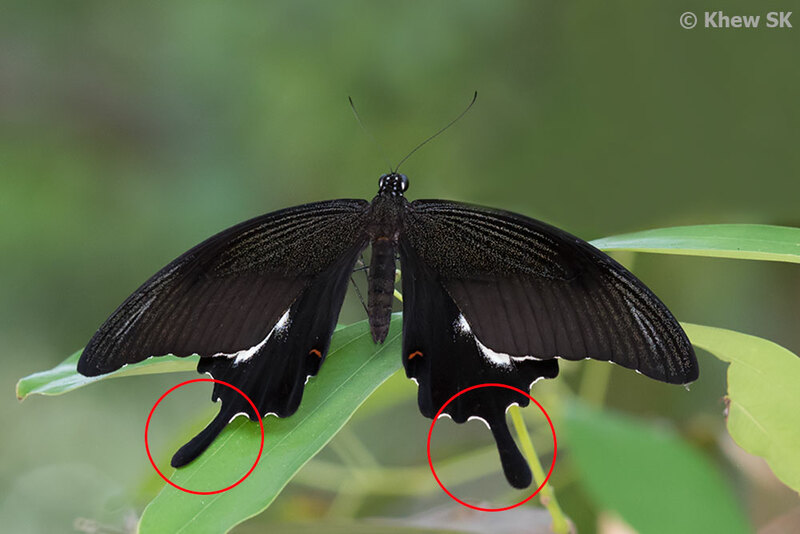 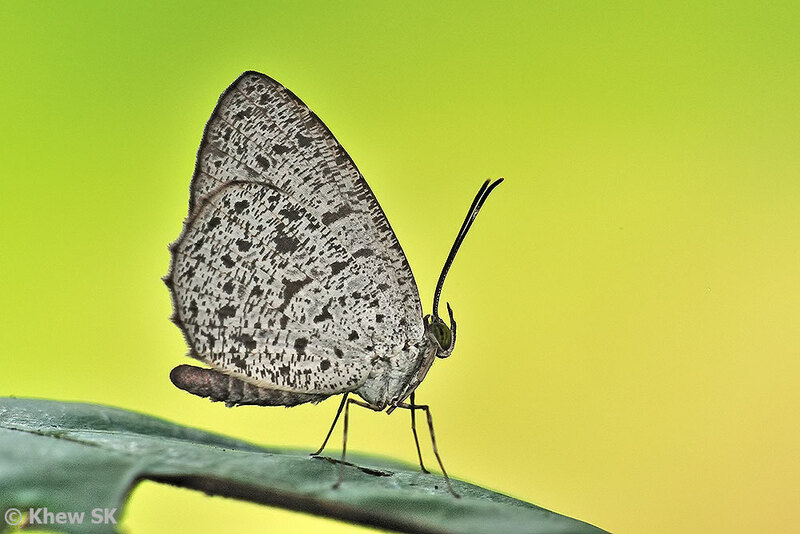 The descriptions of diagnostic features on a butterfly's wings in publications and scientific write-ups can be properly understood and the reader will know where to look and compare these markings if he/she understands the anatomical terminology. 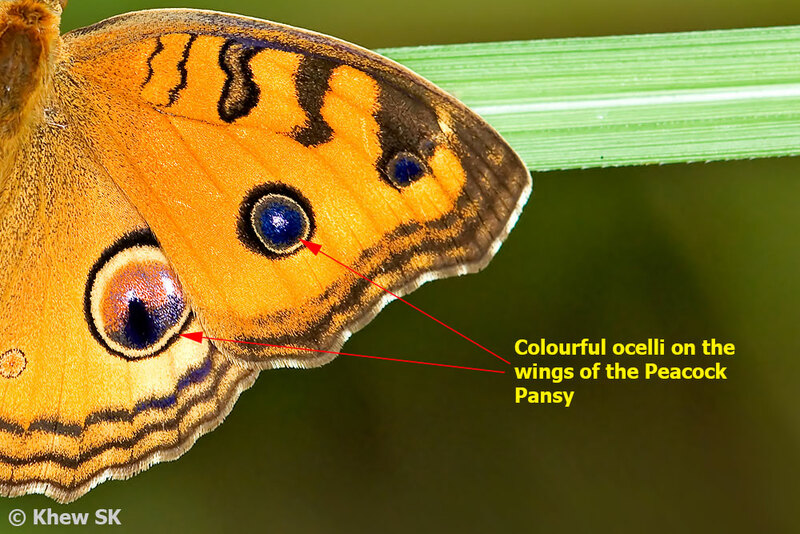 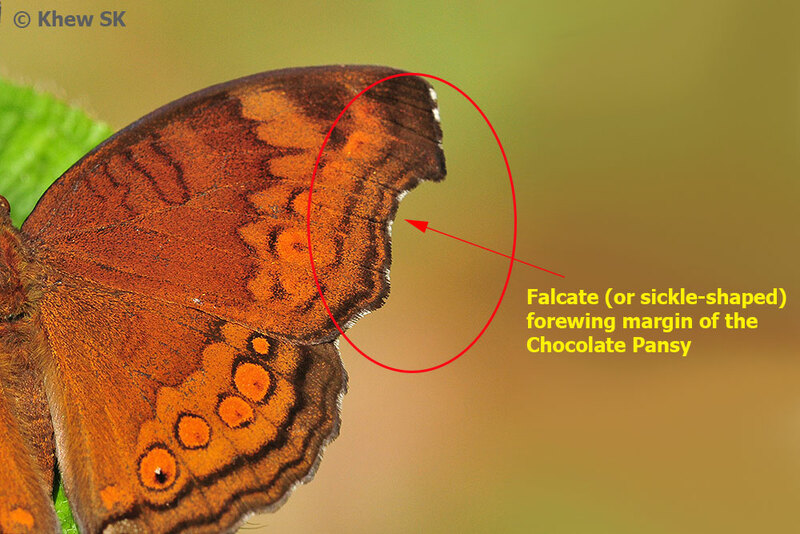 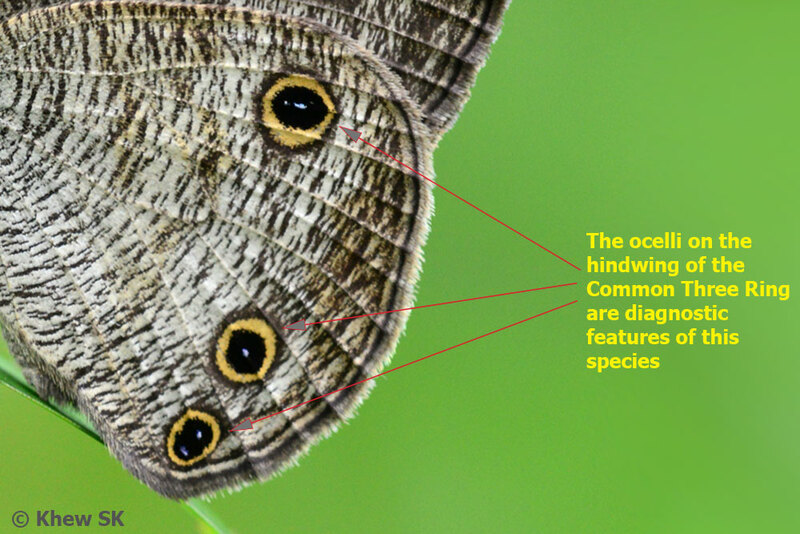 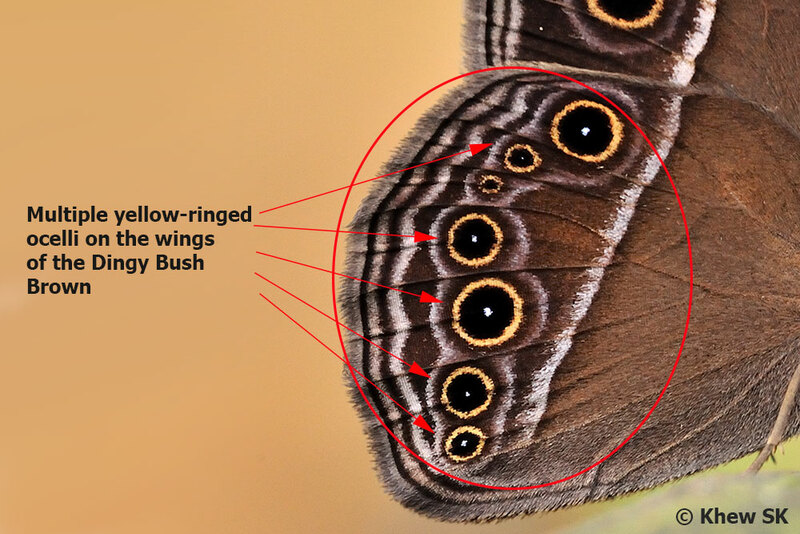 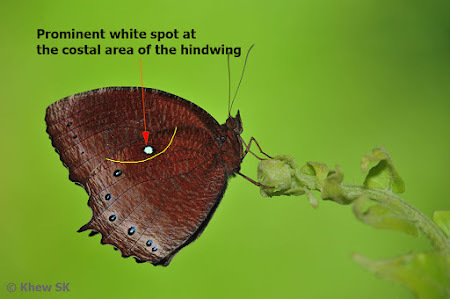 Learning the names of various parts of the wings can also help an observer describe a feature properly so that these can be related to others to help ID a butterfly species. The proper names of these parts is likened to a "GPS" to locate different features on the wings e.g. 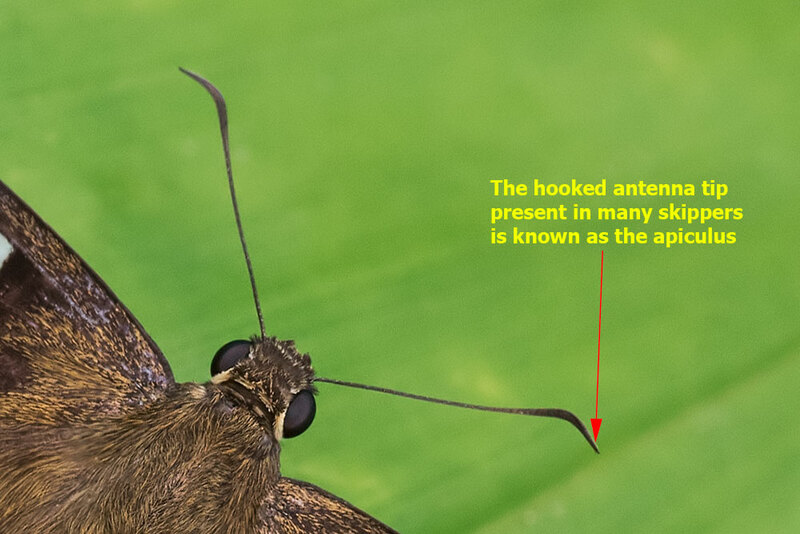 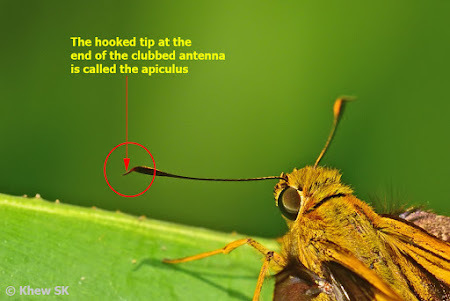 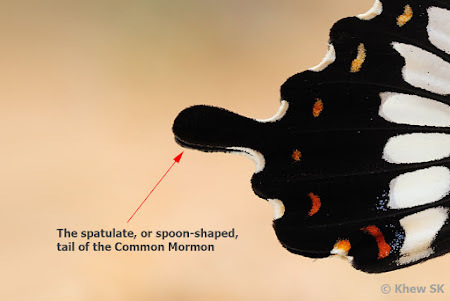 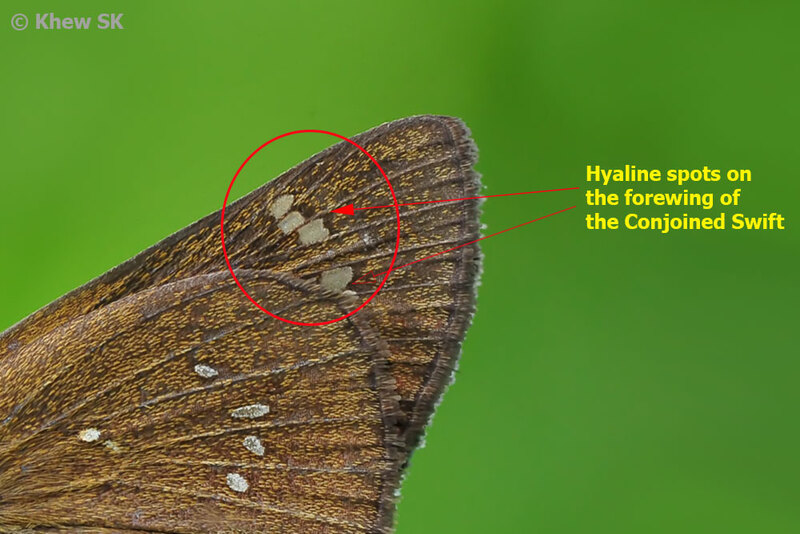 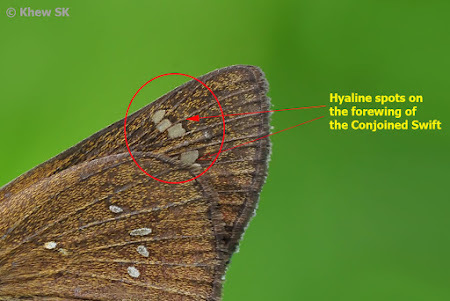 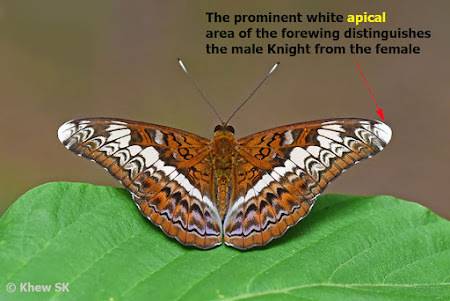 "there are three sub-apical spots on the forewing", would immediately focus on the forewing, and spots that are just adjacent to the apex of the wing. 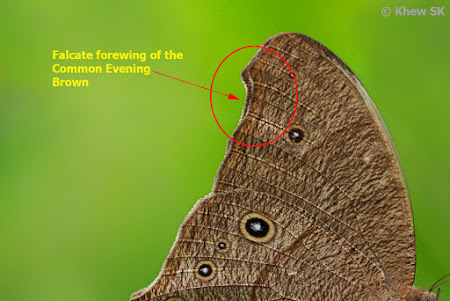 Let us now take a look at the forewing of a butterfly, and familiarise ourselves with the names of the various parts of the interior regions of the wings. 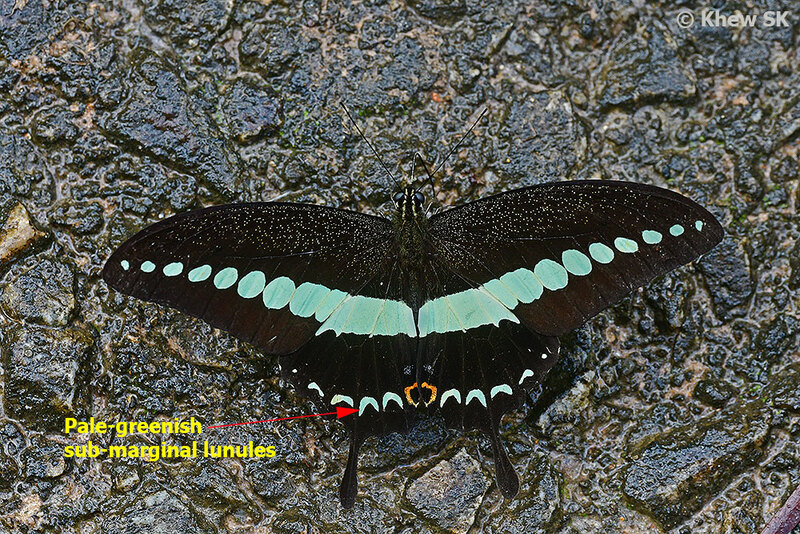 I will separate the forewing into 3 main regions so that each part is treated in installments to better focus on the areas under discussion. 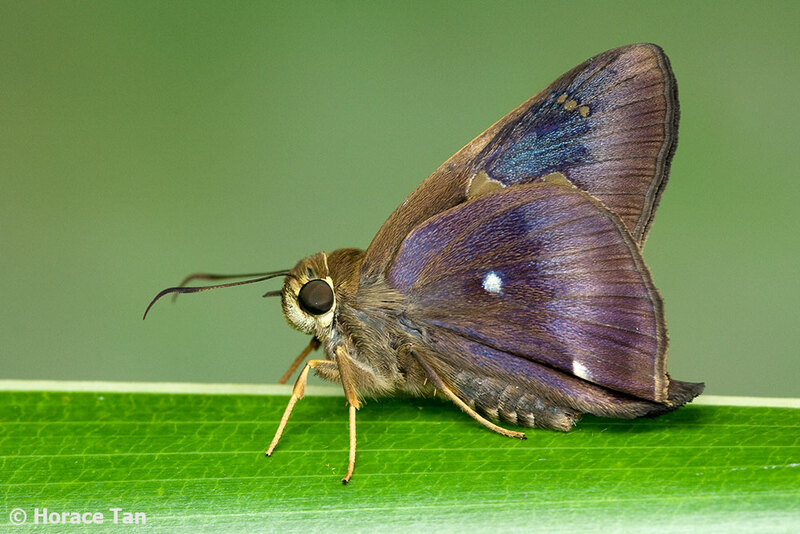 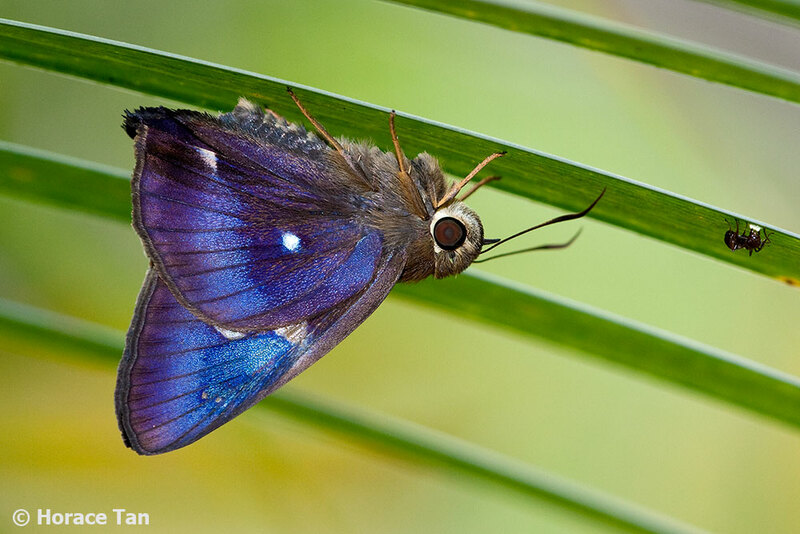 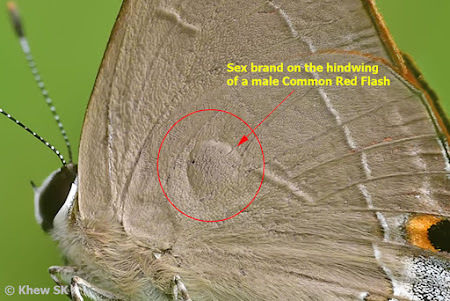 Then an actual butterfly photo is used as an example to illustrate the area concerned. However, it is important to note that these areas are not scientifically precise and is only a rough estimate of the part of the wing. At this juncture, it is important to take note of the prefixes "sub-" and "post-". 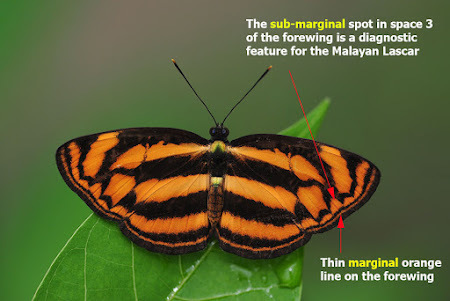 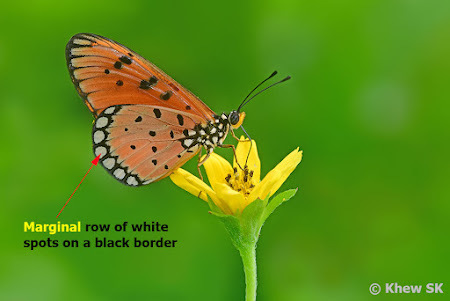 When the prefix "sub-" is used, it means the area that is closer or towards the body of the butterfly, and if "post-" is used, the area is further away from the body of the butterfly. 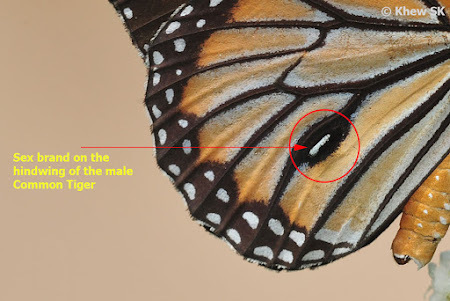 In many butterfly species, the apical area often contains important features that are diagnostic. 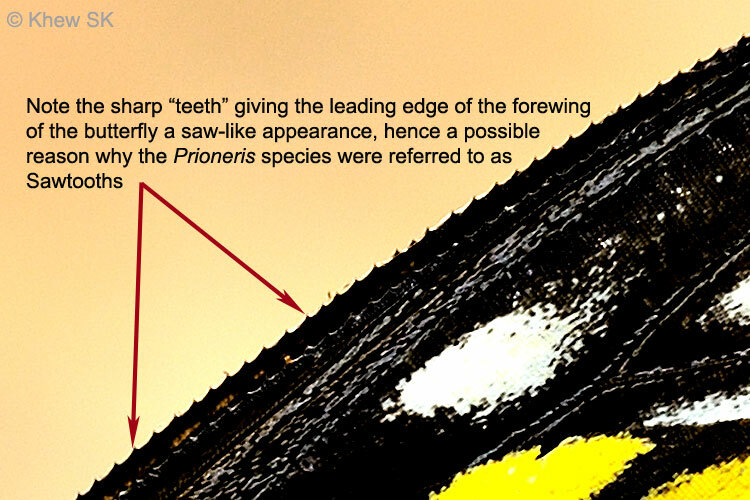 This is the area that is near the apex of the forewing. 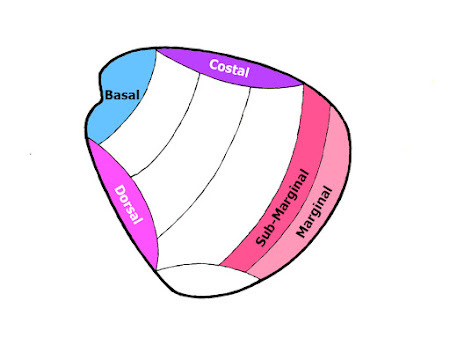 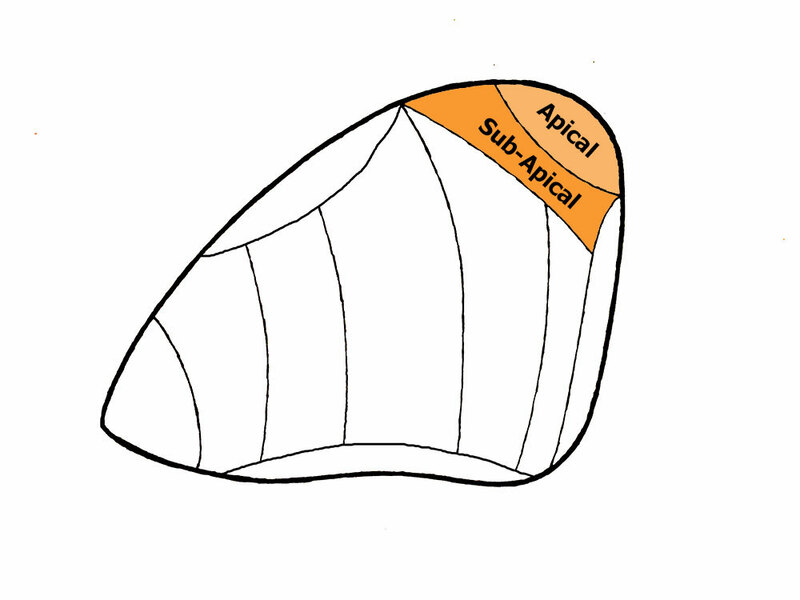 Adjacent to the apical area is the sub-apical area where many features are also found which aid in the identification of butterflies. 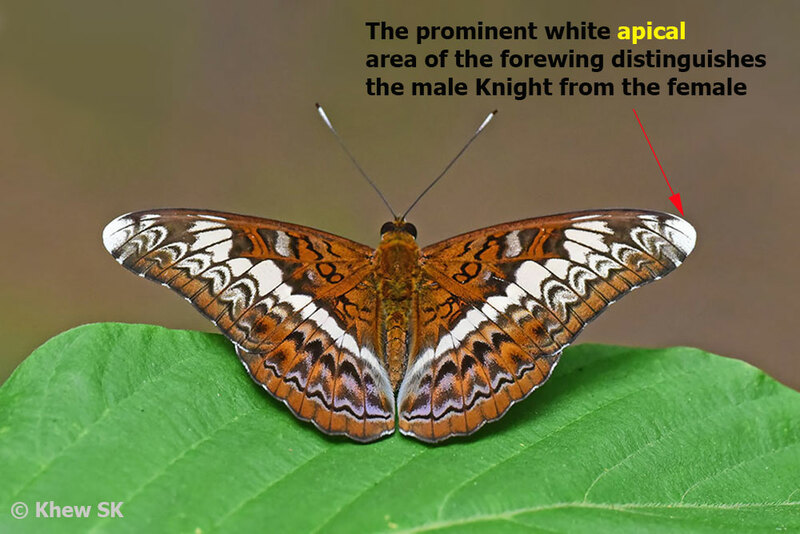 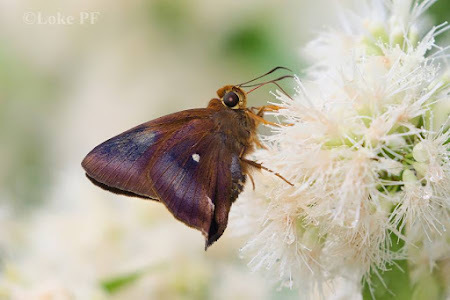 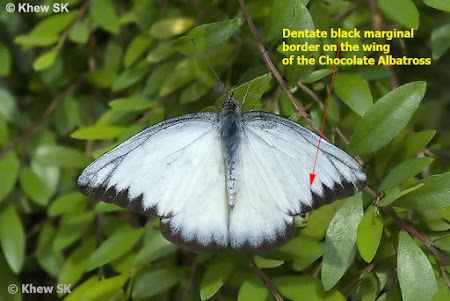 An example of a species with a diagnostic apical area is the Knight (Lebadea martha parkeri) which features "prominent white apical area" that distinguishes it from the female, which does not have its apical area whitened. 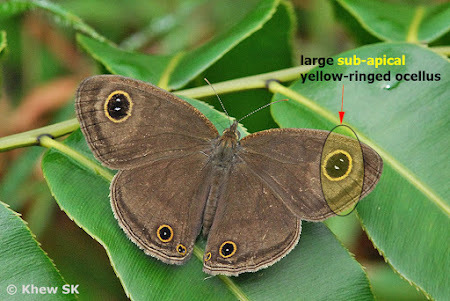 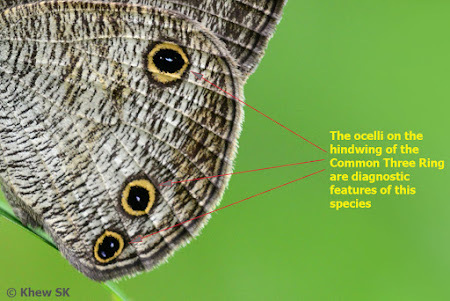 In the 2nd example, the Common Three Ring has "a large yellow-ringed sub-apical ocellus". The next region of interest would be the internal margins or "edge" areas of the wings. 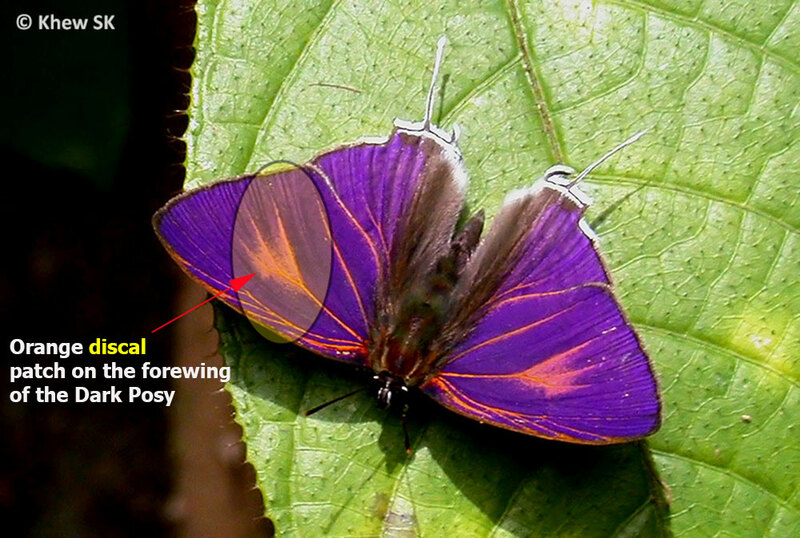 These are the costal area (at the costa of the forewing), the dorsal area (at the dorsum of the forewing) and the basal area (at the base of the forewing). 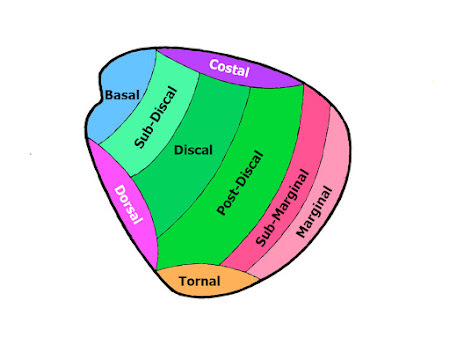 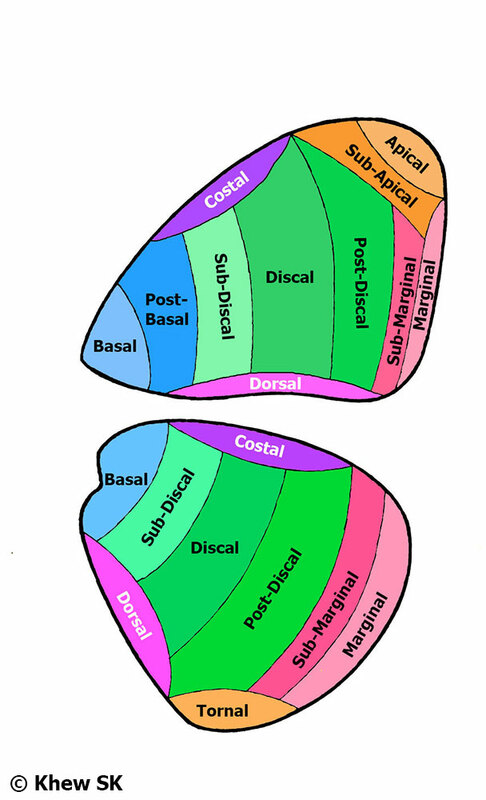 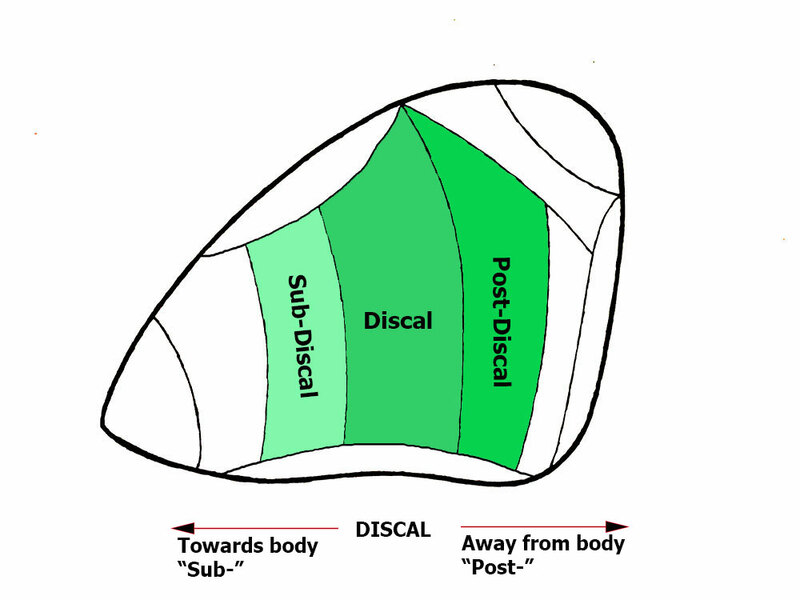 The area next to the basal area is the post-basal area (further away from the body, hence "post-"). 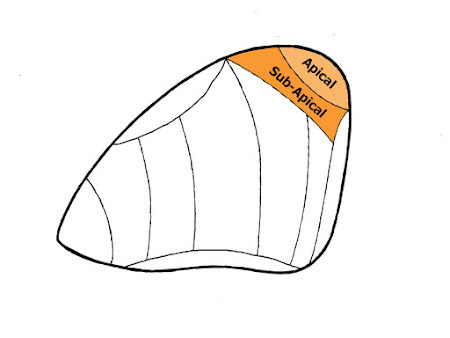 The outer wing edge is called the marginal area and the area next to it is referred to as the sub-marginal area. 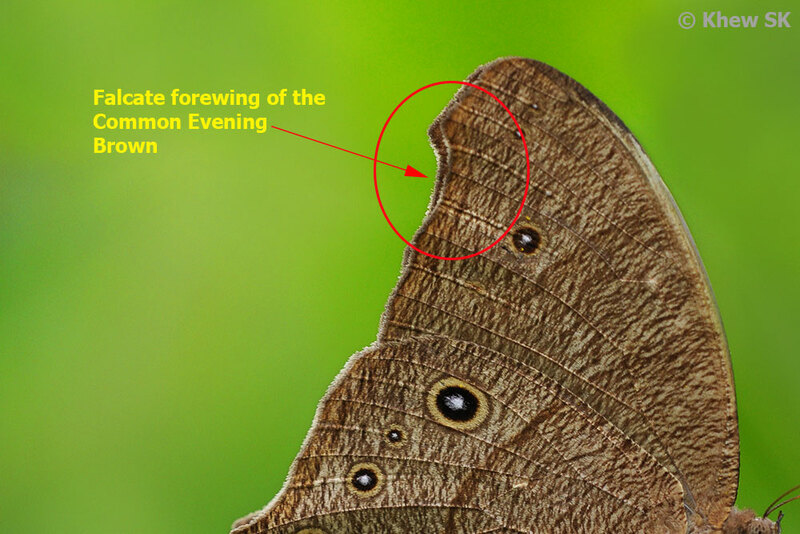 On the interior region of the forewing, are the areas that are associated with the wing cell. 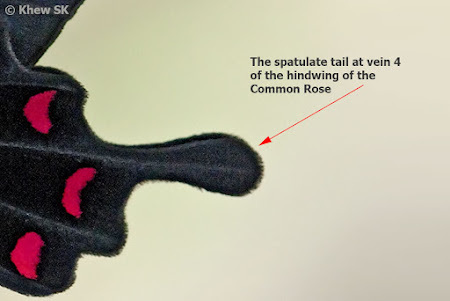 The cell (or disc) has been described in Part 2 with the wing venation. 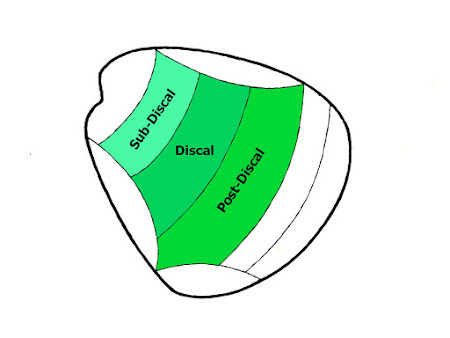 The areas around the cell is usually called the discal area. 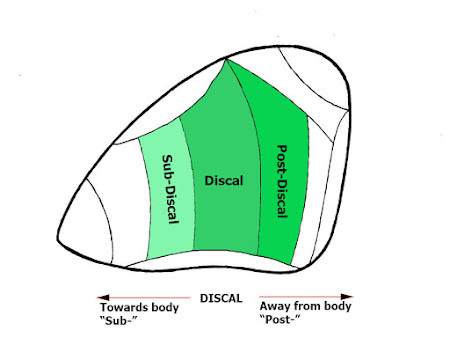 The area that is further away from the butterfly's body is referred to as the post-discal area, whilst the part that is nearer to the body is called the sub-discal area. 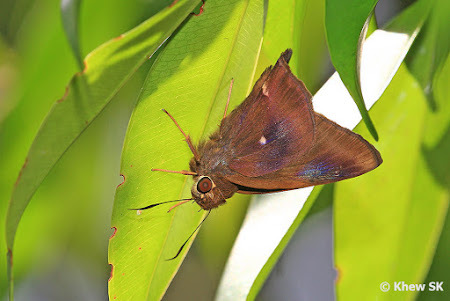 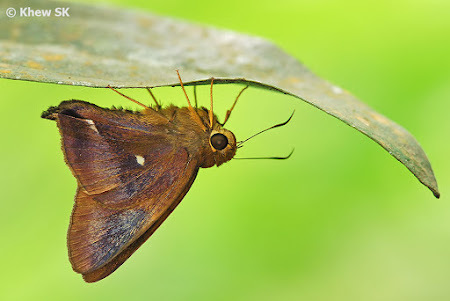 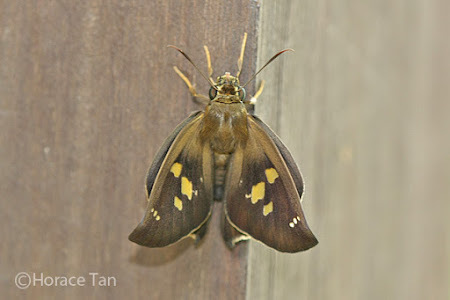 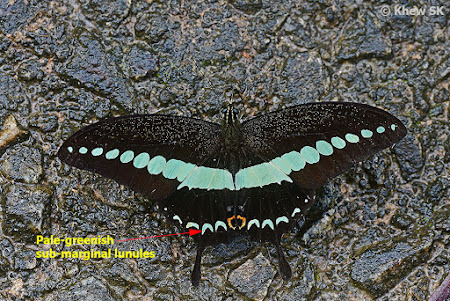 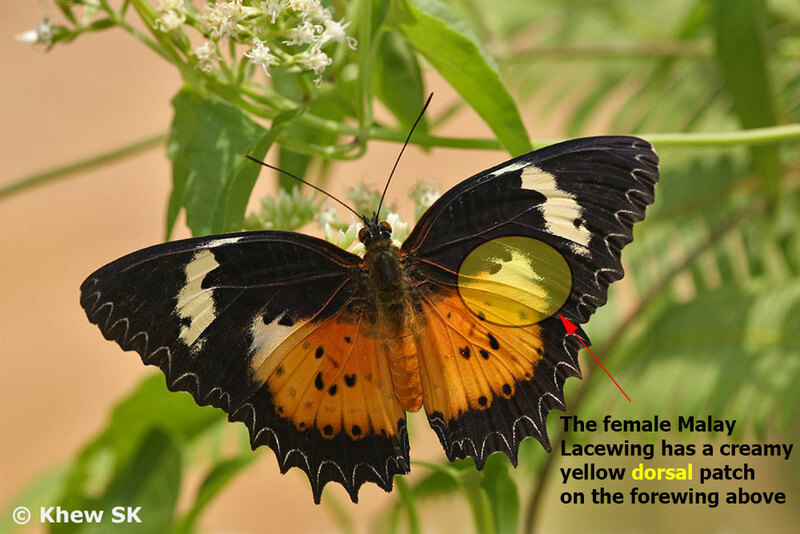 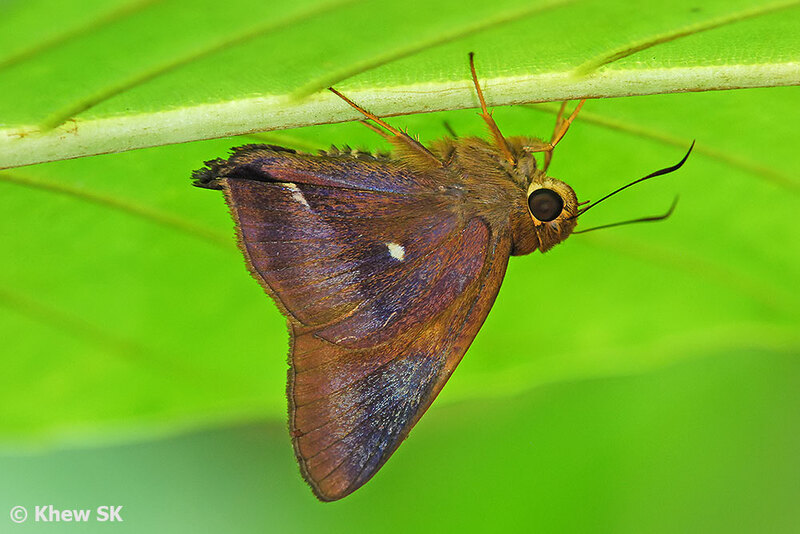 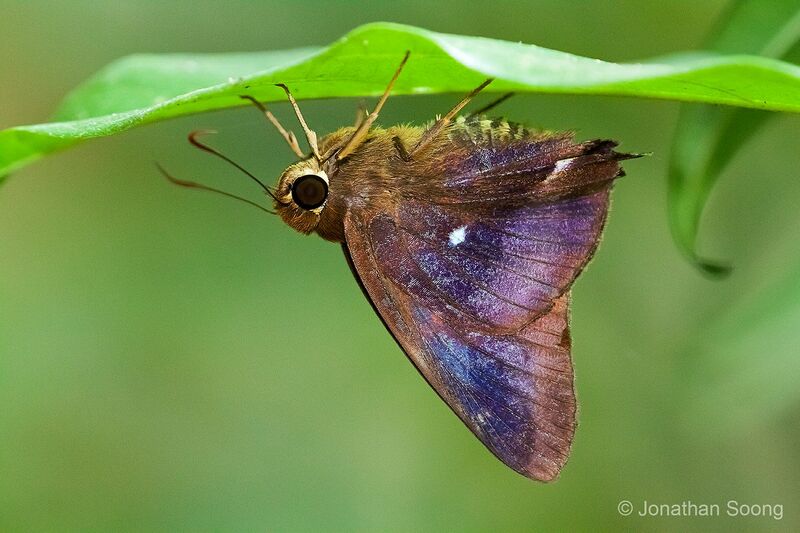 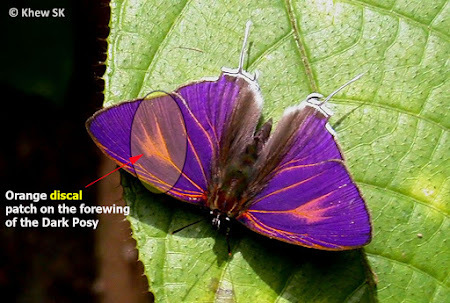 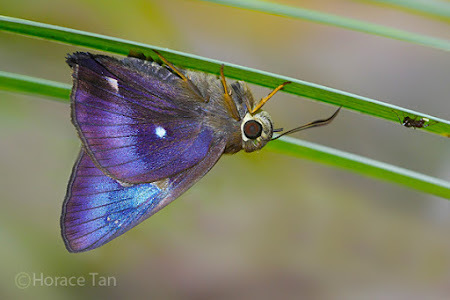 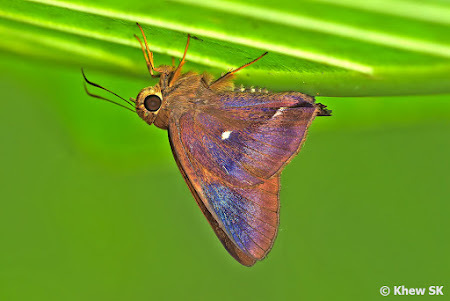 In the examples shown, the orange discal patch on the forewing above separates the male of the Dark Posy (Drupadia theda thesmia) from the females and other species of the genus. 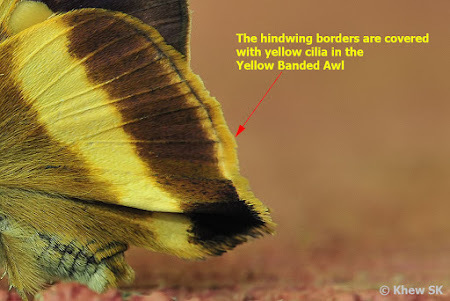 The Banded Yeoman features a broad orange-yellow post-discal band on the forewing. 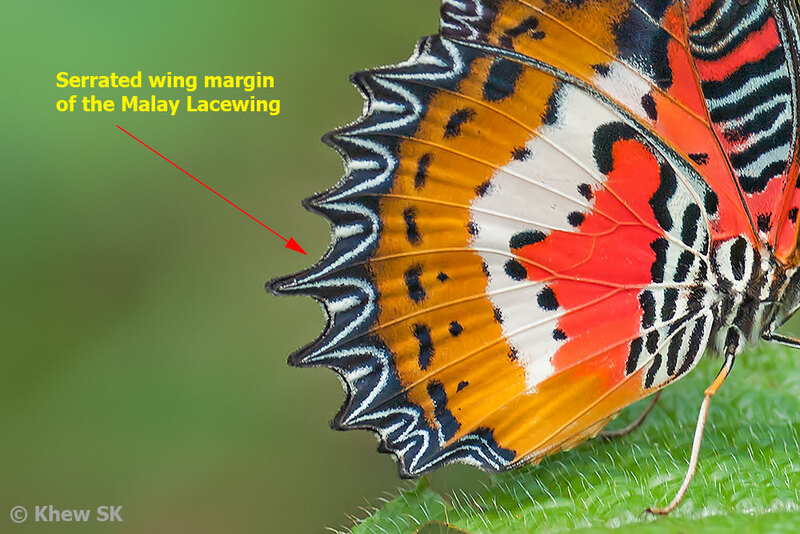 Now let us take a closer look at the hindwing and the terminology of the various parts of the wing. 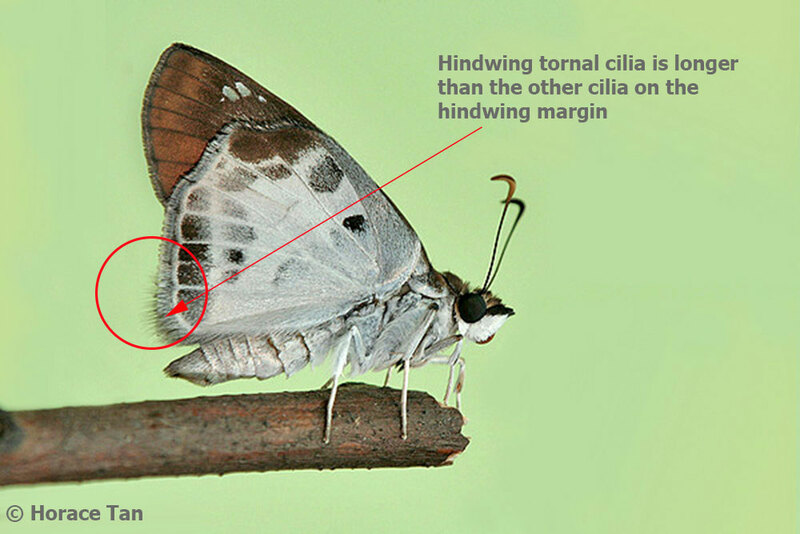 As the wing surface of the hindwings of most butterflies is smaller than the forewing, there is no post-basal area on the hindwing. Of particular interest is the tornal area of the hindwing. 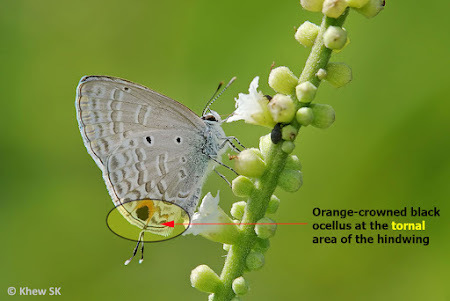 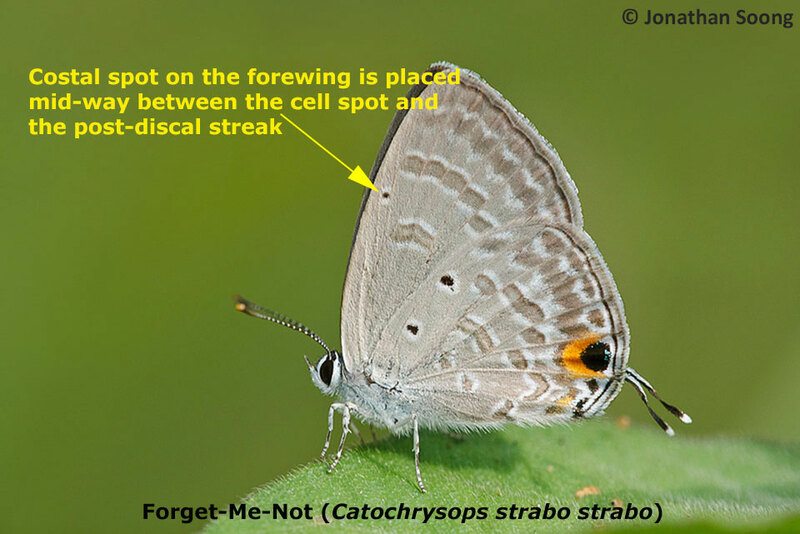 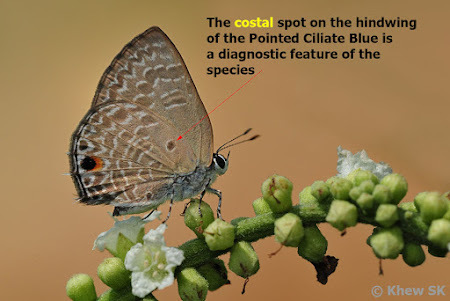 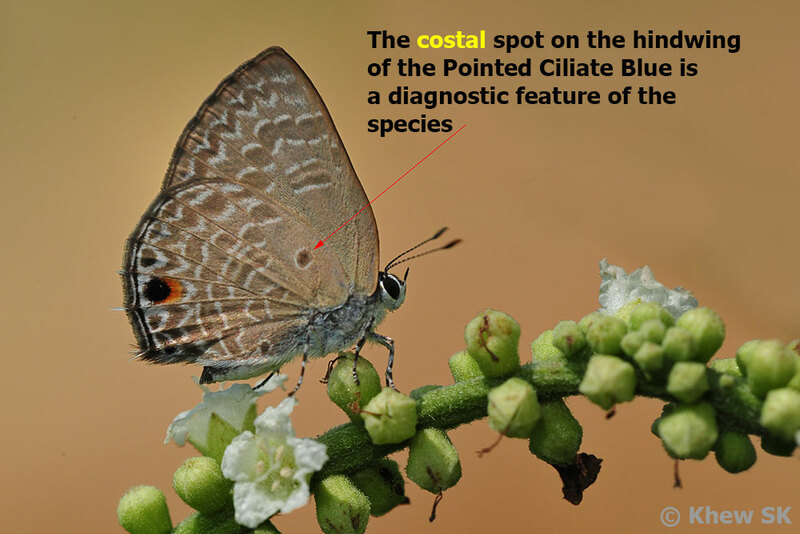 This area carries many diagnostic features like ocelli, tails and a series of markings that help in the identification of Lycaenidae butterflies. 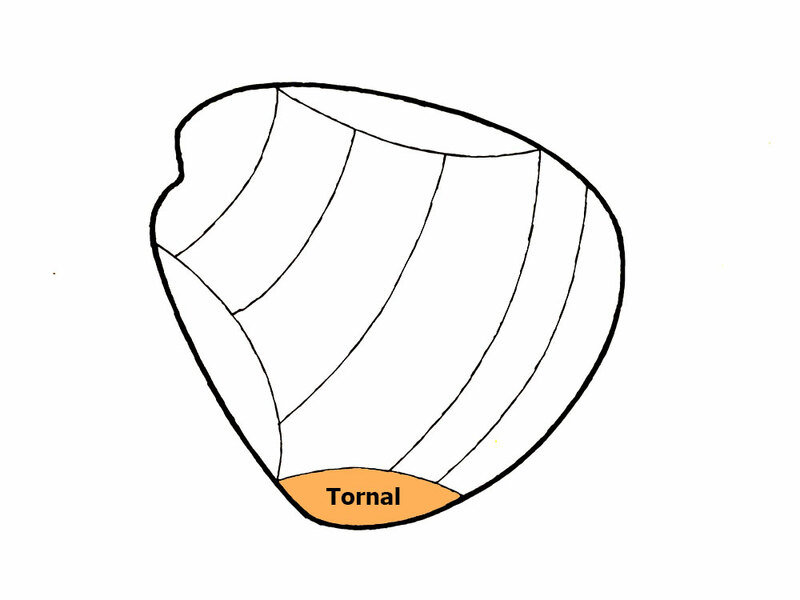 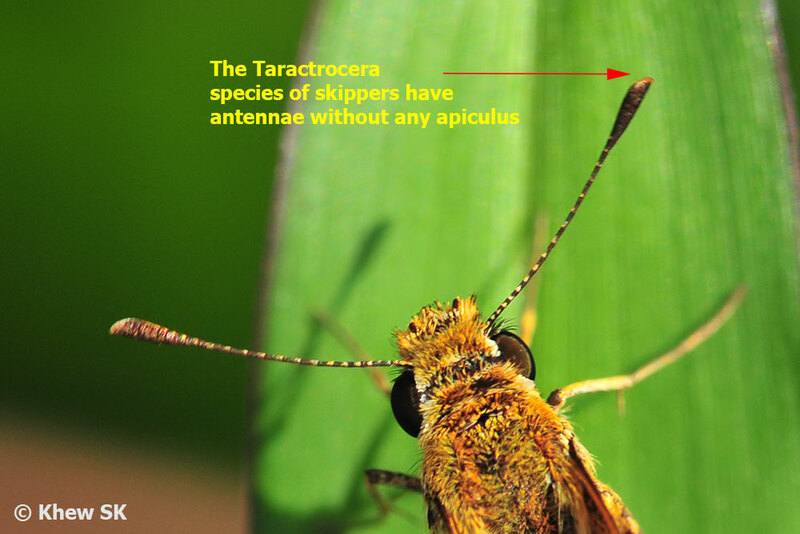 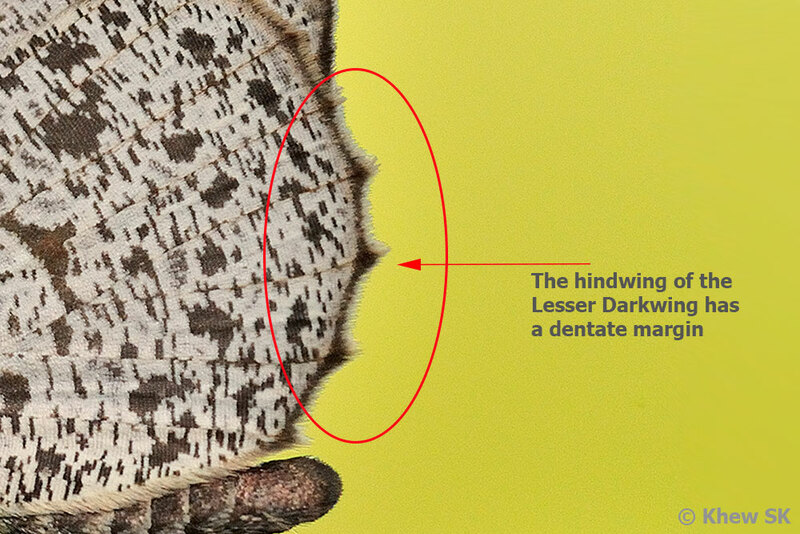 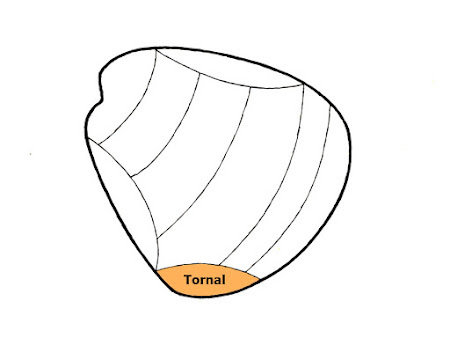 The tornal area is near the tornus of the hindwing. 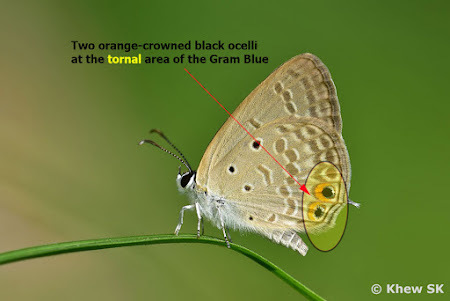 An example of the diagnostic feature of the orange-crowned ocellus and long tail at the tornal area of the Silver Forget-Me-Not (Catochrysops panormus exiguus), compared to the twin orange-crowned ocelli and short tail of the Gram Blue (Euchrysops cnejus cnejus). 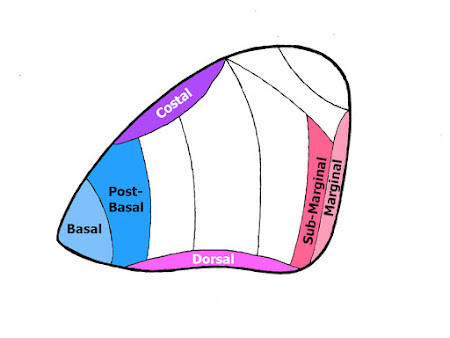 Next, we look at the margins of the hindwing that are somewhat similar to the forewing, with the marginal, sub-marginal, costal, dorsal, and basal areas. 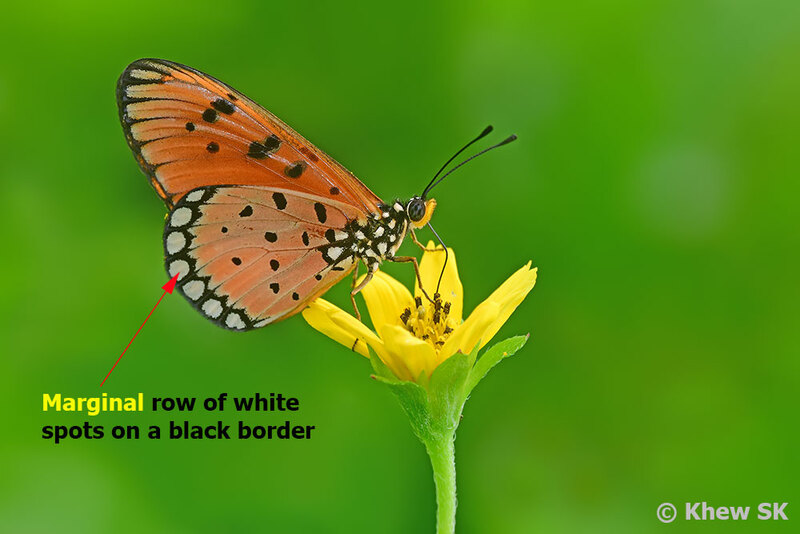 A few quick examples here are the Tawny Coster (Acraea terpsicore) with the white spots on a black marginal border, and the Dwarf Crow (Euploea tulliolus ledereri) with a row of white marginal and sub-marginal spots. 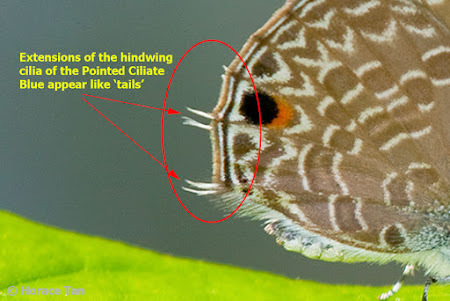 In the Pointed Ciliate Blue (Anthene lycaenina miya), the large costal spot on the hindwing is a diagnostic feature to separate it from the similar-looking Ciliate Blue. Finally, the interior region of the hindwing features the discal, sub-discal and post-discal areas of the wing that are associated with the section that encompasses the cell of the hindwing. 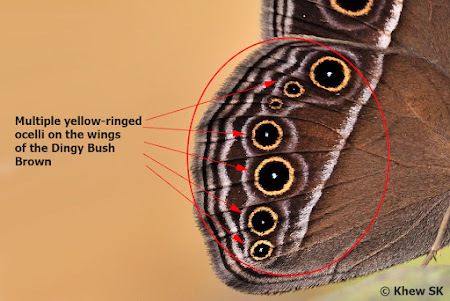 Like in the forewing, this area often has many spots, stripes, bands and other features that help to identify a butterfly. 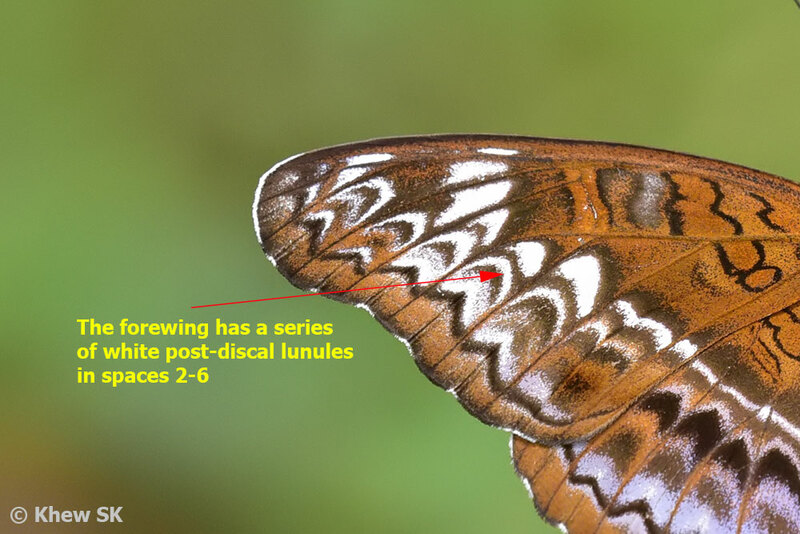 In the example shown here, the white discal band on the hindwing of the various Neptis spp. is diagnostic and helps to distinguish the various species found in Singapore. 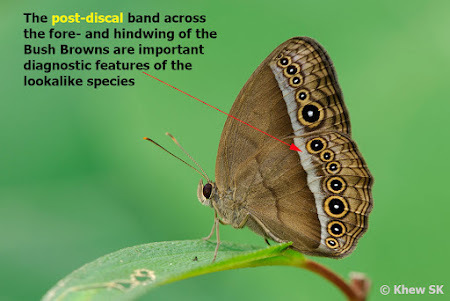 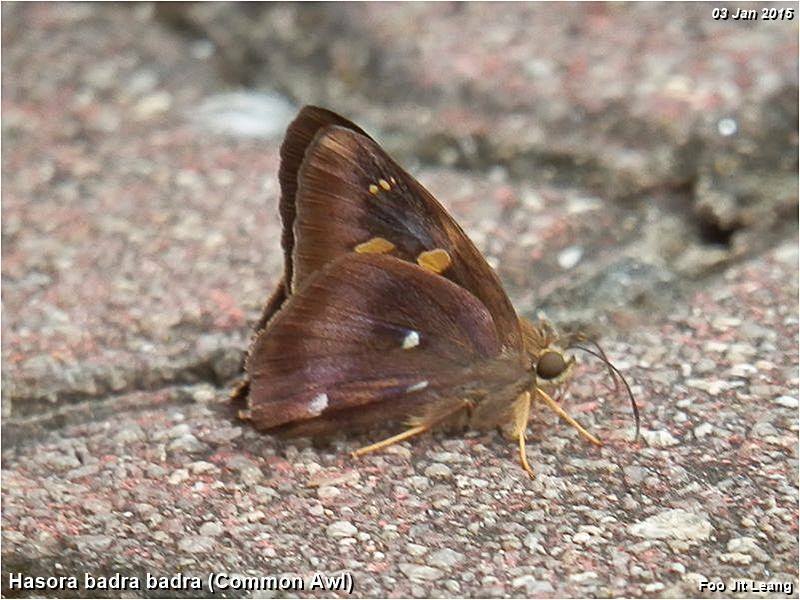 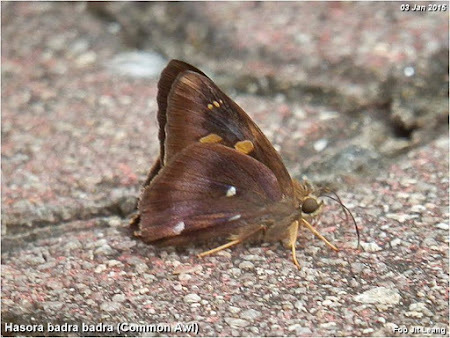 The post-discal band on the fore- and hindwing of the Bush Brown (Mycalesis spp) is an important feature that helps to separate the many lookalike species in the genus. With the knowledge of these basic terminology used in a butterfly's anatomical features, a hobbyist can now combine the key descriptors in terms of wing margin names, venation (and spaces between veins) and interior regions of the wings to better understand how the physical features of a butterfly are described and where to look for specific diagnostic markings to help in the identification of different species of butterflies. 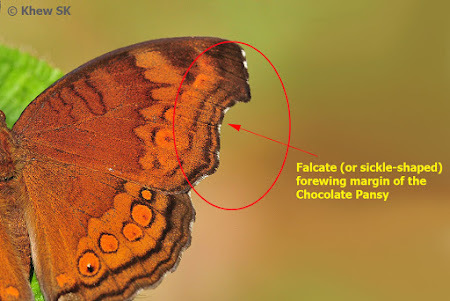 These 3 blog articles are by no means exhaustive and an enthusiast who is interested should continue to equip him/herself with a glossary of terms beyond these basic anatomical terminology of butterflies. 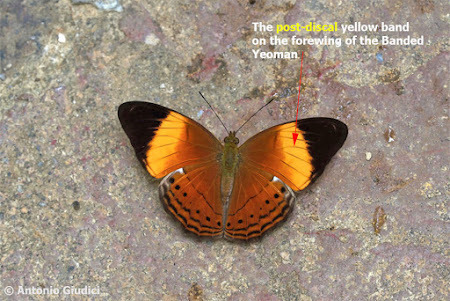 Text by Khew SK : Photos by Antonio Giudici, Khew SK, Bobby Mun and Jonathan Soong. 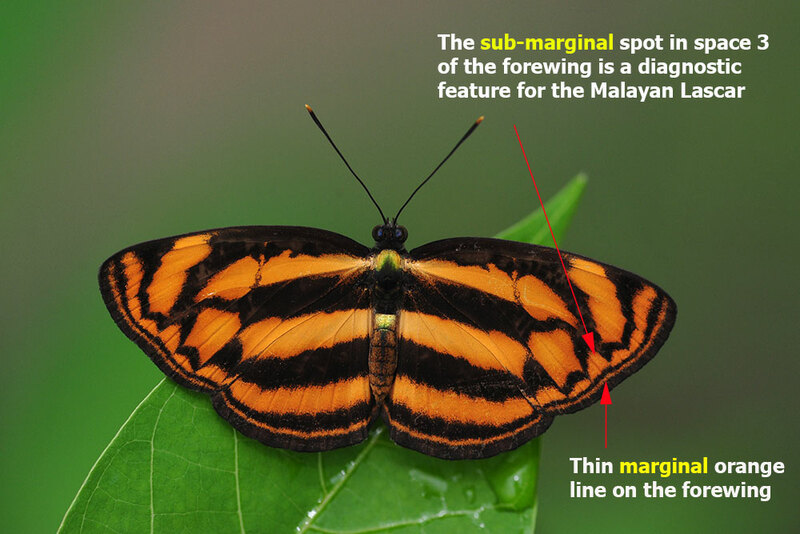 Line diagrams of butterfly wings from Butterflies of West Malaysia and Singapore by WA Fleming.